No matter, how advanced your business equipment is, your customers won’t care if they have to wait at the reception for hours. Managing appointments and queue matters to reduce wait times and improve the quality of customers care. For that, Macshell has a perfect Queue Management System for your business. Our advanced QMS has been designed to serve the end customer. Modern-age technologies are combined in the simplest form to ensure usability, which is why our Electronic Queuing Solutions in India are known for easy operational capacities. Your customers don’t feel troubled by the complex technology when you offer them services via our QMS solutions. Macshell is a leading name in the industry of QMS manufacturers. We have given client-focused solutions to hundreds of clients. And our solutions have helped businesses organize customer flow and improve queue management. Additional Features of Pharmacy Management Software. Our software has the feature to load an entire data from an Excel/CSV file to lessen your startup struggles. It helps in boosting efficiency & reducing pharmacy inventory costs via perpetual usage-based purchase decisions. Pharmacy will be receiving new & refill prescriptions directly into the pharmacy management systems from doctors for review. Point of Sale (POS) scanning, verification of dispensed product, which enhances efficiency and accuracy. Manage multiple queues per consultant. Our management software allows multiple queues, according to the priority of customers. With this approach, each consultant in your business can focus on emergency customers, appointment customers, and regular customers effectively. Handle customers from all backgrounds with our multilingual display and announcement features. You can generate displays and announcements in all major languages utilized by customers in your demographic. Hence, all customers feel clear about the happenings of a waiting room. Improve synchronization between departments with token forwarding feature. This feature allows each department to transfer tokens with necessary information to help the next department. Special instructions increase the efficiency of customers care. Manage queue for different departments. Displays are available for multiple waiting rooms outside each department. All displays become easily controllable with one centralized QMS system. You can save time and offer smooth queue management without exhausting yourself. Improve the quality of reports regarding customer management with our detailed analytics. The in-depth data is visualized with graphs and charts to help management team understand the flow of customers. The reports are shareable to help all departments. Generate and automate daily alerts for consultants, departments and management team. Daily notifications prepare all departments for customer rush for that day. All departments can align their preparations with the upcoming customers for that day. 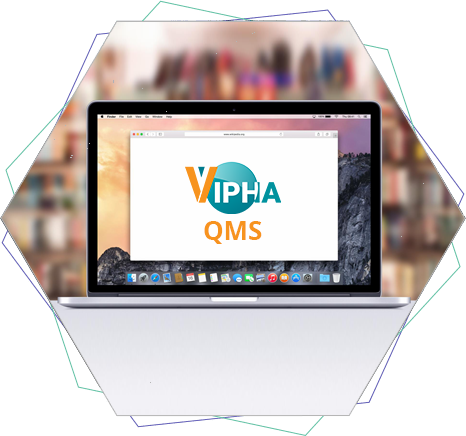 Our QMS solution doesn’t let a single department to feel the pressure of customers in the waiting room. The centralized management allows business staff to create a convenient distribution of load. Hence, customers keep on flowing from one department to other as per their requirement. With our QMS, your business can utilize the available space to its maximum. Divide each space as per the time-based services. One space can manage multiple services on different hours. The time-based services aligned with QMS send customers to the right location for the required assistance. Develop immediate records related to customers. Use names, mobile numbers, and other details collected under the case number. Customer care efficiency and advanced records become possible at the same time.